Welcome to The Abso!ute Sound online! We explore music and the reproduction of music in the home. We believe that the sound of music, unamplified, occurring in a real space is a philosophic absolute against which we may judge the performance of devices designed to reproduce music. Our goal is to provide the resources consumers need to judge how a component's sound either honors or departs from the music's truth, and to make sound purchasing decisions that maximize their experience of reproduced sound. Below is our Issue 140, February / March 2003 table of contents and editorial. Paul Seydor looks at two tables, one affordable, and one…not so—the Basis 1400 and SME's Model 20/2. Wayne Garcia reports on Integra's first "universal" disc player, NAD's C 320BEE integrated amp, and Monitor Audio's Bronze B2 speaker system. TAS recognizes the very best equipment reviewed over the past year. Our picks for the finest source components, in every price range. Neil Gader checks out the latest in a line of reasonably priced separates from Adcom. 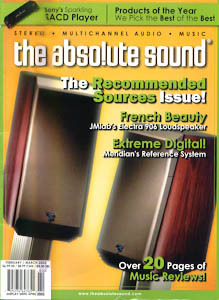 A cheap fix for just about any system using a subwoofer, so says Robert E. Greene. Shane Buettner examines Sony's latest top-drawer multi-format disc spinner. From France, a compact monitor that delivers the goods. Neil Gader auditions the speaker, and reports on his factory visit. In the age of SACD and DVD-Audio, regular CD players keep getting better. Fred Kaplan on a top contender. Larry Alan Kay spends some time with this unusual horn-loaded design from Germany. The winner of our Upper-End Speaker of the Year award, and Jonathan Valin tells you why. Anthony H. Cordesman on Meridian's latest groundbreaking work in digital sound. A five-star (and not expensive) amplifier from Antique Sound Lab, the Miyabi/47 moving-coil cartridge, and current thoughts on SACD and multichannel sound. Bob Gendron, Fred Kaplan, and Andrew Quint effectively carve in stone 2002’s 10 best pop/rock, jazz, and classical albums. A guide to the superior independent and big-name boxed sets, live albums, and collections that you should have received for the holidays, and if you didn’t, can acquire now. Quads Past and Present: Notes on a 30-Year Romance Paul Seydor reminisces on an age-old love.